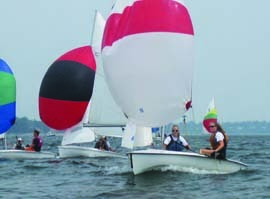 For the tenth time, Cedar Point Yacht Club in Westport, CT hosted the Junior Sailing Association of Long Island Sound (JSA) Junior Race Week for Lasers, Laser Radials and 420s on Monday and Tuesday, July 22 & 23. Twenty-eight clubs from around the Sound participated by sending 128 boats plus a support flotilla of more than 50 instructors, and almost 30 volunteers and support boats from Cedar Point. And then there were the families in Westport, Norwalk and Fairfield that volunteered their homes to house almost 40 racers. With steady winds blowing 8-15 knots and seas of a foot or less, one can deem Cedar Point’s Race Week a great success on every level. Sailors were challenged on the water with long courses, and rewarded on land with hot dogs provided by Super Duper Weenie and some intense volleyball and corn-hole tossing. The breeze on day one was some of the best seen all summer on the Sound with winds blowing around 12-15 knots and slight chop, conditions which provided a textbook day of 420 and Laser racing. With a fleet of 57 boats, the 420 Race Committee worked hard to get off five races on the first day. The first boat to finish was sailed by Morgan Simmonds and Brooke McGoldrick, representing Pequot Yacht Club in Southport, CT, with William Dumke and Sophie Kay, also from Pequot, following closely in second place. Just south of the 420s, conditions were nearly identical during the six races on the Laser course. In the 60-boat Radial fleet, Jack Budill from Larchmont Yacht Club and Jared Gaynes from American Yacht Club were battling each other for the lead after the first day of racing. Gains were made through surfing waves and keeping the boat flat and fast on upwinds, two key factors in the success of sailors on both courses. Also on the Radial course was a small fleet of 13 standard Lasers, led after day one by John Sommi from Shelter Island Yacht Club after William McKeige from American Yacht Club suffered a brutal OCS that earned him 14 extra points. As with the other fleets, good breeze brought better competition to the shores of Cedar Point, and all were hungry to get back out on the water for day two. On Tuesday the 420 course was subject to slightly lighter breeze than the day before, with boats sailing under cloudy skies in about 8-10 knots of wind. Morgan and Brook continued to dominate the fleet with William and Sophie right on their heels. In the four races on day 2, Morgan and Brook earned two more bullets and ultimately secured their position atop the podium with first place, followed by William and Sophie with Tucker Hersam and James Haranzo out of Noroton in third. On the Laser course, the Radial fleet was won by Jack Budill, who came back after his OCS with four bullets on the second day. Second and third place were claimed by Jared Gaynes and Samuel Papert (also from American Yacht Club), respectively. In the Standard fleet, William McKeige took the largest platter home to American, followed by John Sommi and Taylor Brimberg of Stamford YC. Coaches and sailors alike were pumped with the races, and the Cedar Point Race Committee (PROs Sharon Bernd and Brian Swingly, Chief Judge Nelson Stephenson and Scorekeeper Paula Olson) left everyone tired and satisfied after two tough days of sailing. Full results can be found at jsalis.org.